Dan Rather Claims That Global Warming ‘Rarely Tops The Headlines.’ Is That True? Climate change is seldom far from my mind. It’s causing real damage and death. It’s so omnipresent it rarely tops the headlines, but it’s one of the most important stories of our time. Reality continues to close in and it will likely be devastating. Attention must be paid. Liberal journalists routinely complain that global warming coverage has been “siloed” or marginalized. More recently, The New Republic’s Emily Atkin said news outlets needed to connect every extreme weather event — in that case wildfires — global warming. NRP and MSNBC anchor Chris Hayes were forced to defend their supposed lack of global warming coverage. Hayes said global warming segments had been a “palpable ratings killer” as a reason he didn’t do them very often. However, just because large networks didn’t focus much on global warming, since they’re driven by ratings, that doesn’t mean mountains of climate coverage isn’t generated every year. 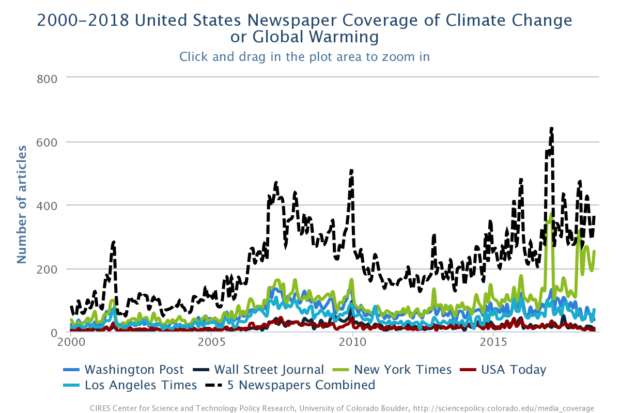 Northeastern University professor Matthew Nisbet took issue with Atkin’s claim of climate coverage being “siloed.” He pointed to data showing thousands of articles written by just five major U.S. newspapers. 2. Staffers working at @mediamatters + @climateprogress (where @emorwee got her start) have long manufactured this claim + driving a self-serving narrative on the Left that the news media is failing in its coverage of climate change. Thousands of articles have been written on the topic, including 252 articles from The New York Times alone in July 2018, according to University of Colorado researchers. Nisbet cited these figures. And those figures likely don’t include the digital-only articles written at The Washington Post and other papers tracked by university researchers. Type “climate change” into your google browser, go to the “news” section and you’ll get 81.5 million results.